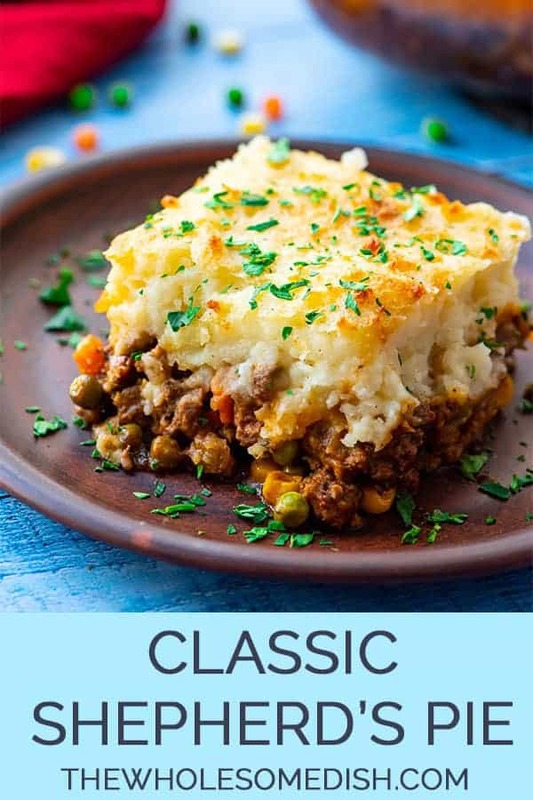 The Best Classic Shepherd’s Pie – AKA Shepards Pie or Cottage Pie. Ground Beef (or lamb) with vegetables in a rich gravy, topped with cheesy mashed potatoes, and baked. So, this is how you spell it: Shepherd’s Pie. But, from doing a quick google search, it came to my attention that TONS of people think it’s Shepards Pie. 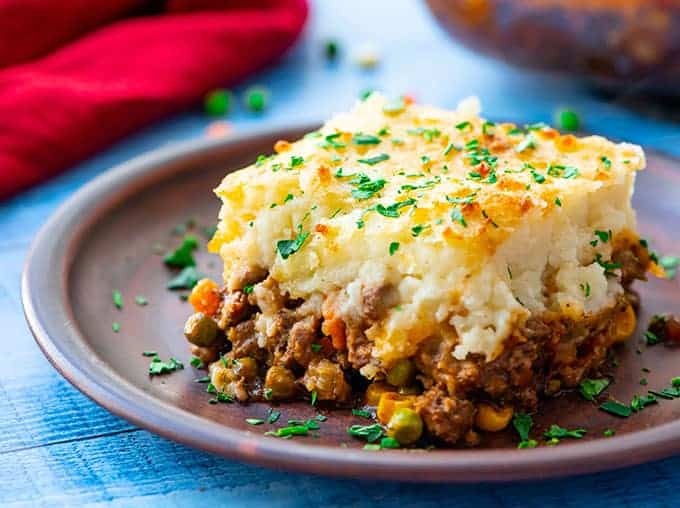 Traditional Irish Shepherd’s Pie would actually call for ground lamb. The difference between Shepherd’s Pie and Cottage Pie is the meat. 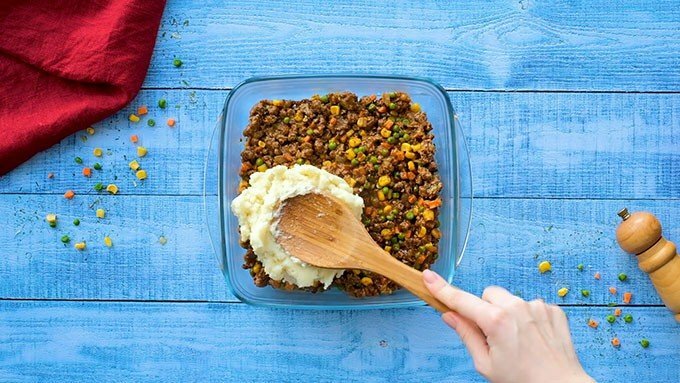 Cottage Pie uses ground beef, while Shepherd’s Pie uses ground lamb. I called this recipe Shepherd’s Pie. But, I wrote the recipe so that you could use ground beef or ground lamb. I typically use ground beef because it is widely available. But, for a special occasion, like St. Patricks day, I would use ground lamb. Sauté some chopped onions in olive oil. 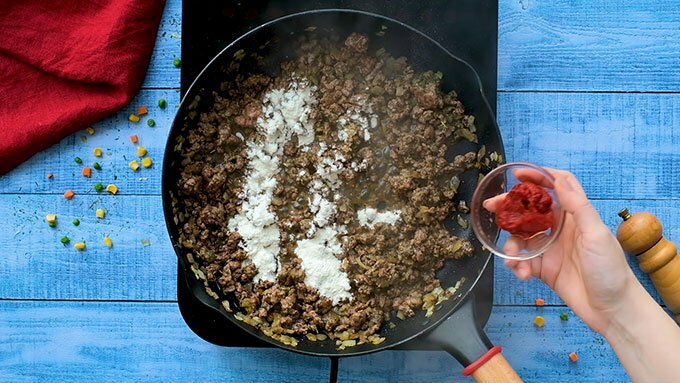 Add ground beef or ground lamb. Add dried parsley, dried thyme, dried rosemary, salt, and pepper. Stir and cook the meat mixture until the meat is browned. Add minced garlic and Worcestershire sauce. Cook the garlic for a minute. Add flour and tomato paste. Add beef broth, frozen mixed peas and carrots, and frozen corn kernels. Simmer the meat gravy until it is thick. Boil some peeled and chopped potatoes until they are soft. Add butter, half & half, parmesan cheese, garlic powder, salt, and pepper. Top it with the cheesy mashed potatoes. Bake until the meat is bubbling and the potatoes are golden. Making the best Shepherd’s Pie is not difficult. But, there are a few steps to it. You have to make the meat mixture, the mashed potatoes, assemble the casserole, and bake it. I find that the easiest way to make this dish is to work ahead. You could make the beef or lamb mixture ahead of time. Or, you could make the mashed potatoes ahead of time. You could also make the whole recipe ahead of time. Just assemble the casserole, cover the dish, and keep it in the refrigerator until you are ready to bake it. I find it is best to bake it within 3 days of preparing it. 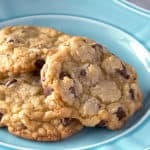 When you are ready to bake it, take it out of the refrigerator for about 20 minutes before you need to bake it to let it start coming to room temperature. Uncover it, and bake. Watch the Video for the Best Classic Shepherd’s Pie Below. 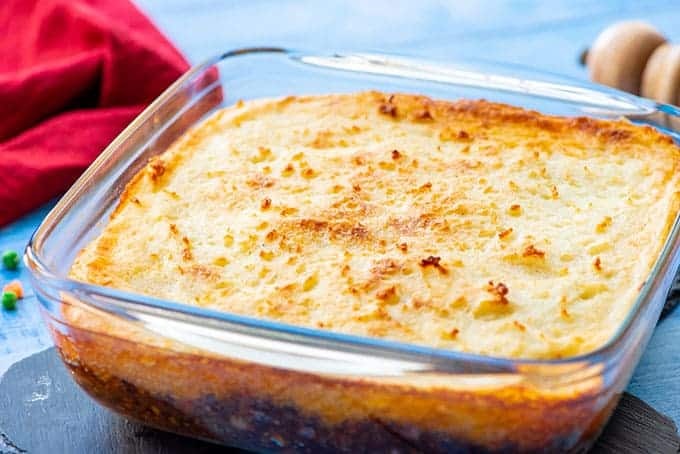 The Best Classic Shepherd's Pie - AKA Shepards Pie or Cottage Pie. Ground Beef (or lamb) with vegetables in a rich gravy, topped with cheesy mashed potatoes and baked. 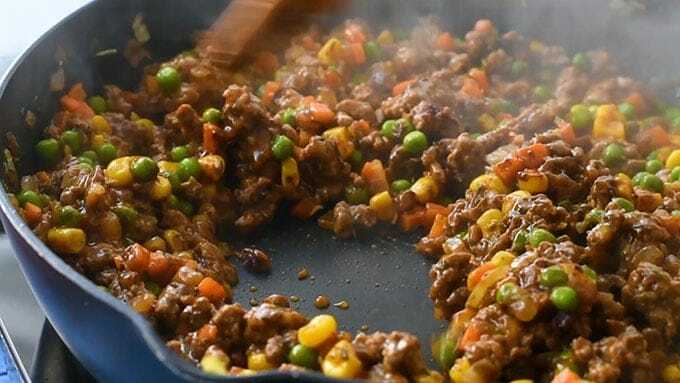 Add the oil to a large skillet and place it over medium-high heat for 2 minutes. Add the onions. Cook 5 minutes, stirring occasionally. 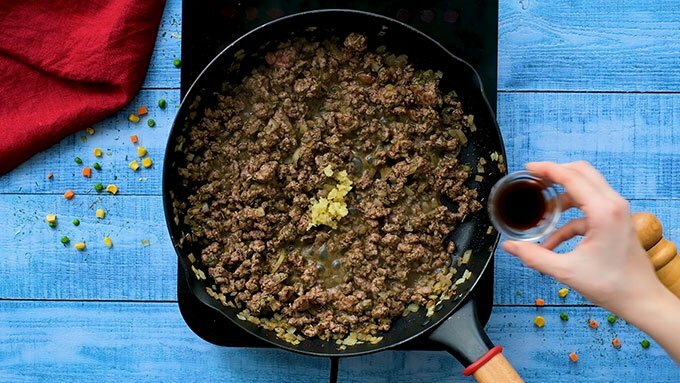 Add the ground beef (or ground lamb) to the skillet and break it apart with a wooden spoon. Add the parsley, rosemary, thyme, salt, and and pepper. Stir well. Cook for 6-8 minutes, until the meat is browned, stirring occasionally. Add the Worcestershire sauce and garlic. Stir to combine. Cook for 1 minute. Add the flour and tomato paste. Stir until well incorporated and no clumps of tomato paste remain. Add the broth, frozen peas and carrots, and frozen corn. Bring the liquid to a boil then reduce to simmer. Simmer for 5 minutes, stirring occasionally. Set the meat mixture aside. Preheat oven to 400 degrees F.
Place the potatoes in a large pot. Cover the potatoes with water. Bring the water to a boil. Reduce to a simmer. 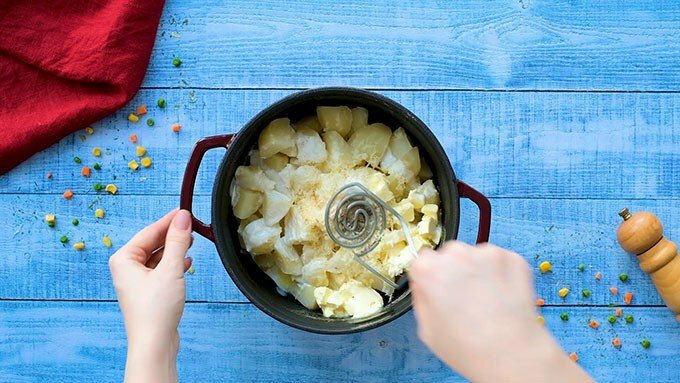 Cook until potatoes are fork tender, 10-15 minutes. Drain the potatoes in a colander. Return the potatoes to the hot pot. 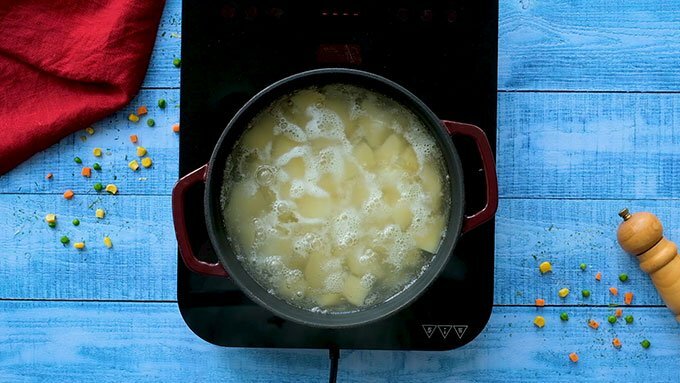 Let the potatoes rest in the hot pot for 1 minute to evaporate any remaining liquid. Add butter, half & half, garlic powder, salt, and pepper. Mash the potatoes and stir until all the ingredients are mixed together. Add the parmesan cheese to the potatoes. Stir until well combined. Pour the meat mixture into a 9x9 (or 7x11) inch baking dish. Spread it out into an even layer. Spoon the mashed potatoes on top of the meat. 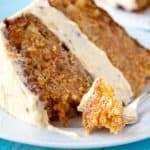 Carefully spread into an even layer. If the baking dish looks very full, place it on a rimmed baking sheet so that the filling doesn’t bubble over into your oven. Bake uncovered for 25-30 minutes. Cool for 15 minutes before serving. *If you can’t find frozen mixed peas and carrots, you could use 1/2 cup frozen peas and 1/2 cup frozen sliced carrots. Wow I’m excited to make this–your photos are awesome! 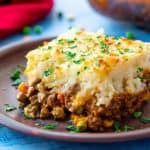 I’ve actually been a fan of your site for about a year now, but after seeing this shepherd’s pie I knew I had to speak up 🙂 Thanks for all the great recipes! 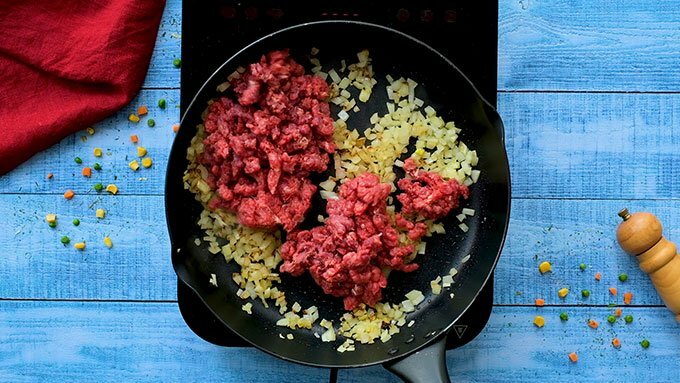 We always made shepherd’s pie with lamb growing up, but I’m going to try it with beef now! 🙂 Thank you so much for sharing, the dish looks so scrumptious! Seriously my favorite meal to order and making it myself was super easy! I add dry onion soup mix to casserole dish before adding beef ,then mix the two ingredients. I teach Culinary Arts and I am always looking for recipes to use the “usable waste” from pounds and pounds of potatoes when my students are learning how to cut Classical Cuts. “Usable waste” it the trims from the potato after squaring them up to make precise Batonnet and and Small Dice cuts. We are trying this tomorrow and baking them in smaller 7″ disposable pans. Thank you for the recipe and comments. This dish is the ultimate in comfort good. So many layers of flavor. 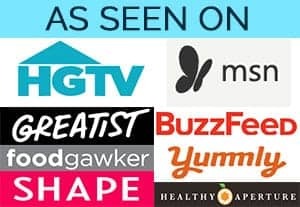 I’ve been looking for a good Sheperds pie recipe. This is it!. 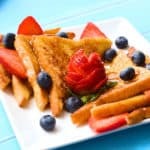 This recipe was very good and fun to make! We both loved it a And had never had Sheppard Pie! I added chopped mushrooms to this….Loved it! Am I missing the temperature at which to bake the shepherd’s pie? I can’t seem to find it. Does anyone know? 400 degrees for 25-30 minutes. I made this recipe with beef, exactly as instructed. It was absolutely delicious! And it was even better the next day. This was incredible comfort food and I will be making it again. I personally like Cottage Pie over Shepherd’s Pie because I do not like the taste of lamb. 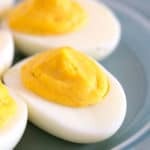 Such a versatile dish, you can make it so many ways. Made this today…awesome taste..made recipe..just used mixed frozen veggies..and “cheated” by spreading Bob Evans mashed potatoes on top…super easy great flavor. …. would be the suggestion that this would serve six. If I had to split this six ways I would not be happy! I doubled it and was great the next day. I had never made Shepherds Pie before, but will make it again.